Today, we filed the only amicus brief supporting a 20-state challenge to Obamacare being led by Texas Attorney General Ken Paxton. The case is pending in the U.S. District Court for the Northern District of Texas In December 2017, President Trump signed the Tax Cuts and Jobs Act of 2017, which eliminated the Obamacare penalty for failing to comply with the individual mandate. The Texas lawsuit asks that Obamacare be declared unconstitutional in its entirety, since a zero tax cannot form the basis of the exercise of the taxing power. Today our firm filed an amicus reply brief in the case of United States v.Bernard von NotHaus in the U.S. District Court for the Western District of North Carolina on behalf of Gold Anti-Trust Action Committee (GATA). 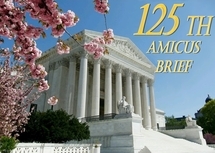 On June 10, 2011, the United States filed a reponse in oppostition to the GATA amicus brief, filed May 31, 2011. Today our firm filed an amicus brief in the case of United States v.Bernard von NotHaus in the U.S. District Court for the Western District of North Carolina on behalf of Gold Anti-Trust Action Committee. We also filed Appendix A to our amicus brief. Today, our firm filed an amicus curiae brief for Gun Owners Foundation in the U.S. District Court for the State of Wyoming on behalf of the State of Wyoming, and the Wyoming Attorney General, Patrick J. Crank. Today we filed an amicus brief for the Center for Government Integrity, a project of Citizens United Foundation, in support of Defendant Richard B. Cheney’s Motion to Dismiss or For Summary Judgement with the U.S. District Court for the District of Columbia.